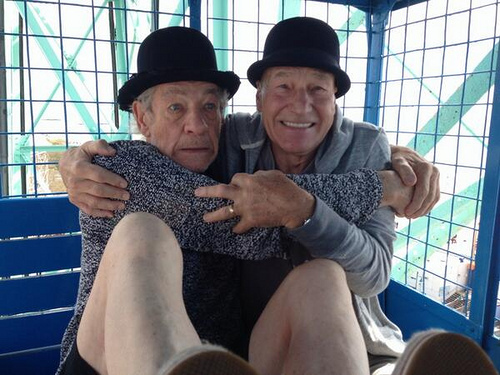 A series of photos of actors Sir Patrick Stewart and Sir Ian McKellen hamming it up at New York City tourist spots during rehearsals for their Broadway run in Waiting for Godot and No Man’s Land has been a hit on twitter. Called “Gogo and Didi Do NYC,” the social media campaign took the bowler-hatted duo from the Empire State Building and Katz’s Deli to Coney Island’s Wonder Wheel and Nathan’s. 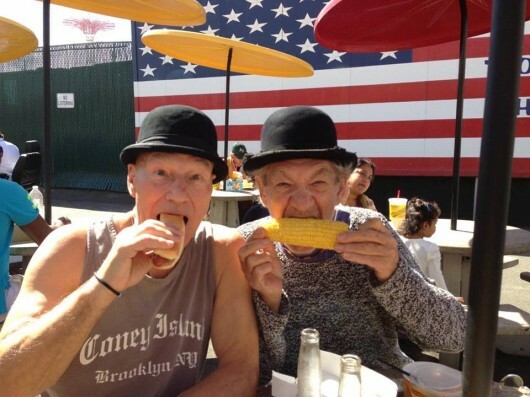 With their last performance set for March 30th, McKellen and Stewart are now inviting fans to bid on three autographed T-shirts custom-printed with their image at a Coney Island souvenir shop during their September visit. In Waiting for Godot, Gogo and Didi are two old tramps, needy indeed. They don’t know where they’ll sleep that night, they don’t know where their next meal will come from, and they hoard their meager resources, sharing whatever they do have. In short, they’re hungry. It seemed a natural fit—Gogo and Didi and City Harvest. City Harvest helps to feed nearly two million New Yorkers facing hunger each year. So bid early, bid often, bid high, and know that you’ll be funding a vital and important organization. But one day in particular was unusually fun—we went out to the famous Coney Island and had a marvelous time. We played skee ball, hopped on the Wonder Wheel (the view from up there is lovely), and went and scoffed hotdogs at Nathan’s. (Ian, being a pescatarian, delighted in corn-on-the-cob and clam chowder.) In a truly bizarre moment, to our surprise we found Leonard Nimoy, seated outside a few tables away, himself indulging in Nathan’s for the first time. After lunch, we strolled back to the boardwalk. Ice cream for me, candyfloss for Sir Ian, on a bench, on the Coney Island boardwalk…two old(ish) Brits enjoying a classic American seaside landmark. As we left the fairground area and the late afternoon was approaching, we stopped off at a souvenir vendor’s booth and posed for a silly portrait that we impulsively had printed up onto three t-shirts. 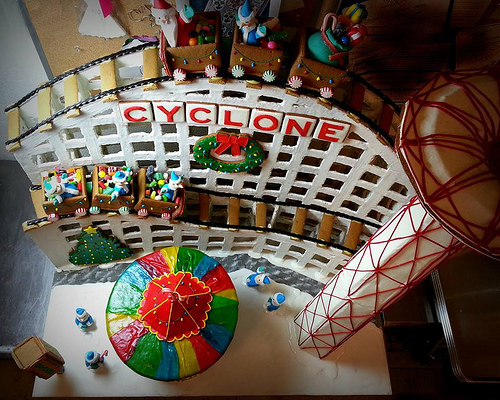 Coney Island’s Cyclone, Parachute Jump and Carousel are among the gingerbread wonders on display at the Le Parker Meridien through January 8th to benefit City Harvest. 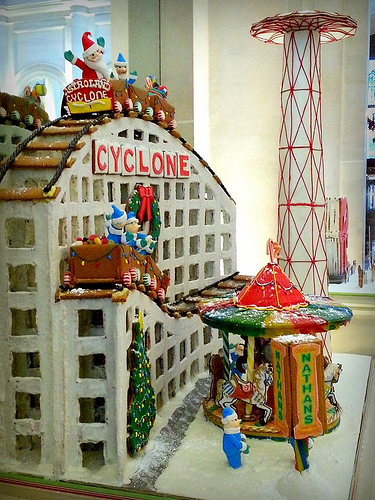 Created by Susanna Caliendo of Rolling Pin Productions and Mario DiBiase of Brooklyn’s Aperitivo Restaurant, the Coney Island-themed confection is among 13 whimsical structures in the 5th annual Gingerbread Extravaganza. 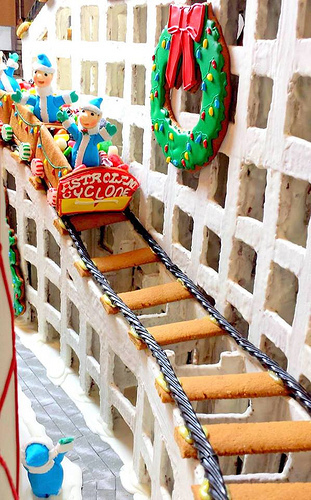 The fondant Santa Claus and his elves ride the wreath-bedecked gingerbread coaster, which has tracks made of licorice and cookies. 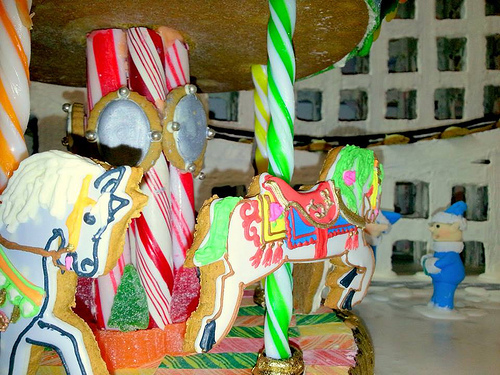 The Carousel’s poles are made of colorful candy canes. Caliendo researched and took great care in the making of the exquisitely detailed horses. She estimates that it took 60-80 hours of work for the two chefs to create the elaborate structure. DiBiase’s training as an engineer before getting into the culinary field was essential to the task of replicating the curve of the Cyclone’s track. This year’s theme of “Quintessential New York” inspired the city’s top bakeries, pastry chefs, and restaurants, to craft such icons as the Chrysler, Empire State and Flatiron Buildings, the Guggenheim Museum, Katz’s Deli and New York Brownstones. You can vote for the structures on display in Le Parker Meridien’s atrium, which is open 24 hours, or online by selecting it on this page. Purchase one ticket for $1 or 5 tickets for $5 through the concierge desk or online to vote for your favorite. Each vote enters the donor in a raffle to win a 5-night stay at the Parker Palm Springs. All proceeds benefit City Harvest, the world’s first food rescue organization, where every dollar rescues four pounds of food. 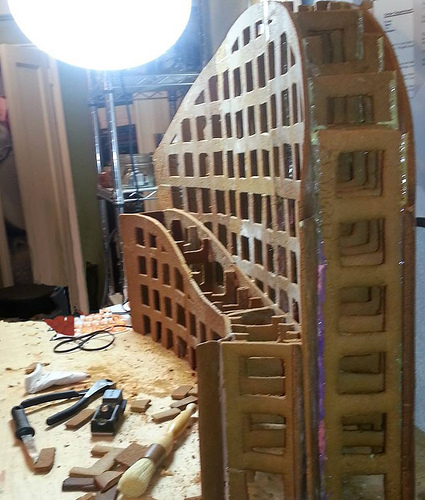 The creation with the most votes will receive the Gingerbread 2013 People’s Choice Award in January.